Winter is not an easy time for birds. They need extra energy to keep warm, especially during long winter nights. To cope with this, they lay down extra fat reserves, though small birds quite often only lay down enough for a single night. Longer nights not only affect the amount of energy a bird uses, they also reduce the amount of time that birds can feed in. Birds, therefore, have to make the most of the daylight hours to replenish their energy reserves before it gets dark. The 2004 BTO Shortest Day Survey, run in association with BBC Radio 4, investigated the patterns behind birds arriving at garden bird feeders first thing on a winter’s morning. 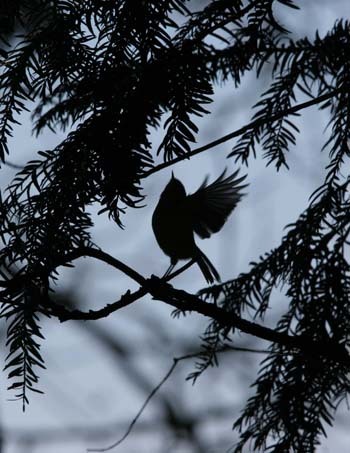 Building on observations from the Shortest Day Survey, the Early Bird Survey investigated what effect, if any, light and heat pollution have on the feeding patterns of birds during a cold winter’s morning. The survey took place in early January 2014. Surprisingly the survey did not find that any species in either urban or non-urban environments arrived into gardens earlier where there were more artificial lights; if anything they tended to arrive later.